The extraordinary LOST WORLDS recreation of the early production J.A. DUBOW MFG. CO. A-2, "Collar Stand" Design. Workmanship, authenticity and fit which must be experienced to be believed! 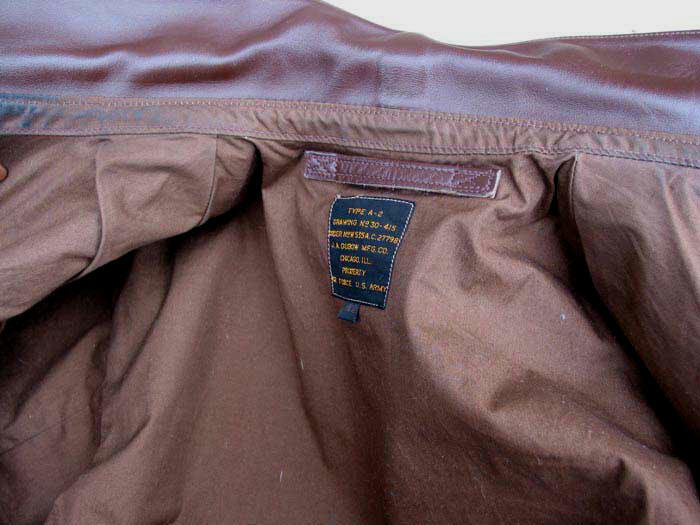 As with our standard WWII issue collar construction, the benchmark for those who know. 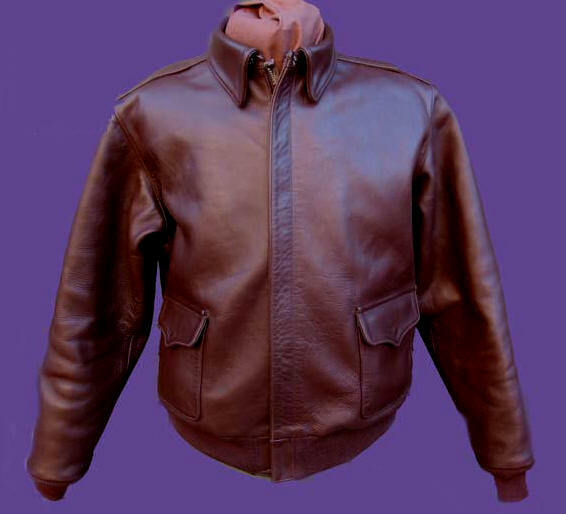 The earliest A-2s used a collar construction different from most WWII examples: a narrow leather band, separately lined and top stitched, attached collar to body (see above), as on many shirts. This more elaborate and time-consuming design produced a slightly different collar shape and roll. A similar early construction is found on our B-2. Prior to WWII the AAF modified the A-2 with a direct collar/body construction. 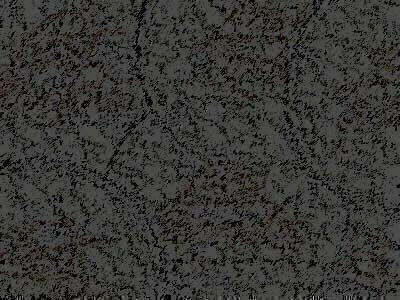 Probable reasons: easier mass manufacturing, desired lower neck profile, better soiling resistance (less lining exposed at neck). The "Collar Stand" design was also inherently asymmetrical, causing pattern and production problems and errors. 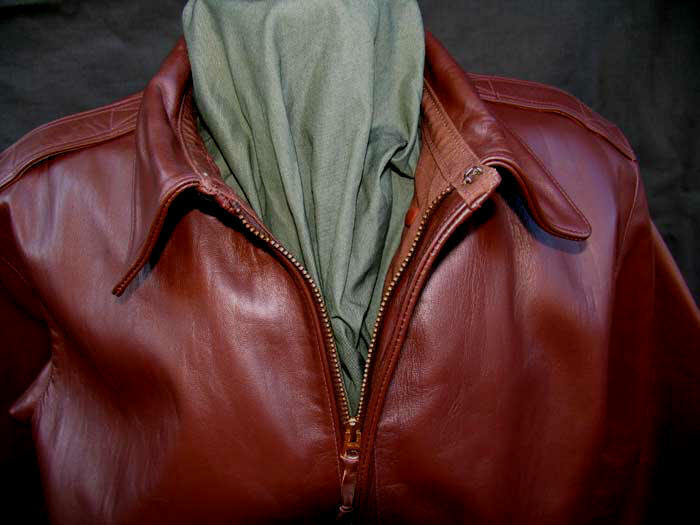 Many original Roughwears, for instance, are truly unbalanced -- displaying a short, compressed frontal collar with the rear extending an inch or more past the neck seam in a fair approximation of the cowl on a clown's costume! Sorry for the sacrilege, Shroud of Turin Pennsylvania and all that (where Roughwears were made) but this is simply not correct design. 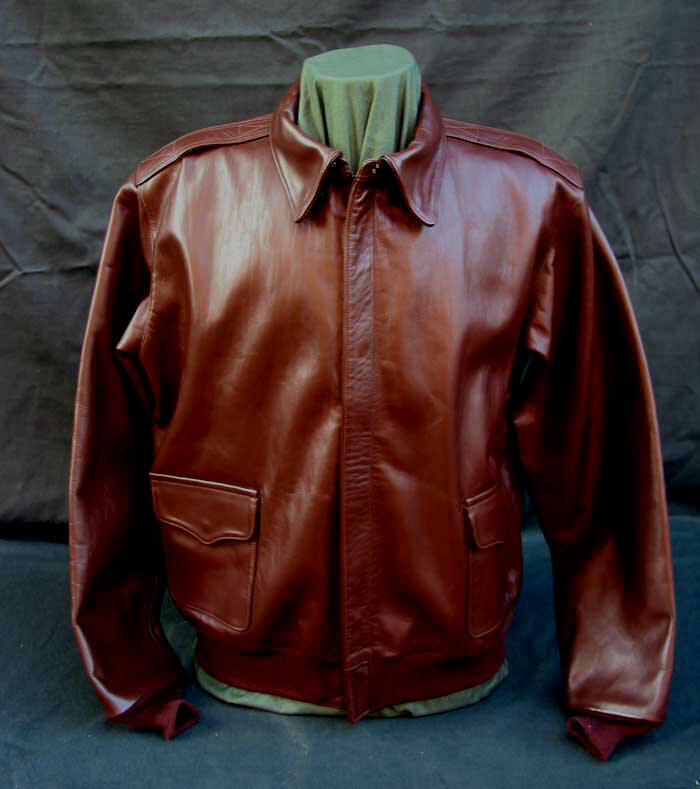 During WWII several major contractors, for unknown reasons, continued to manufacture the "Collar Stand" design, notably Roughwear and Perry Sportswear. J.A. Dubow Mfg. Co. changed production to the standard collar construction. Yet there's no denying the beauty, complexity and uniqueness of the older design. One construction is not "better" than the other. More like vanilla and chocolate -- different. The LOST WORLDS "Collar Stand" A-2, like the original Dubow, is fully symmetrical. If something isn't perfect and balanced, we don't make it. Nor do we copy errors. Consider the beautiful shaping and roll of the collar in the shots above. 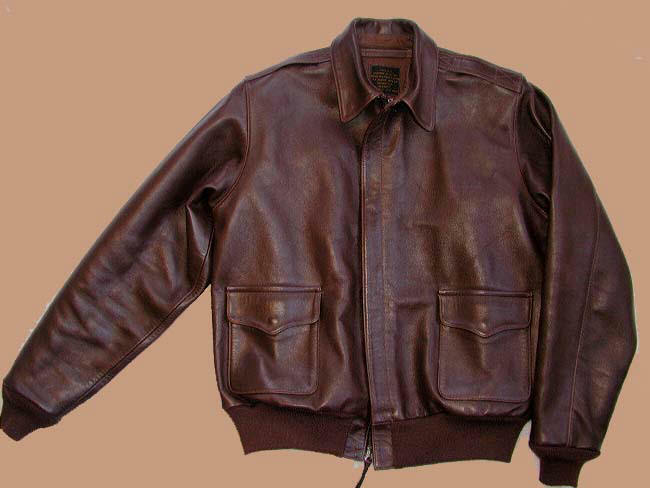 It was different during WWII: many operators in many companies made these jackets and quality and standardization varied -- getting the jackets to airmen was the priority. Ours is perfection. LOST WORLDS has a different perspective on reproduction than some other mfgs. 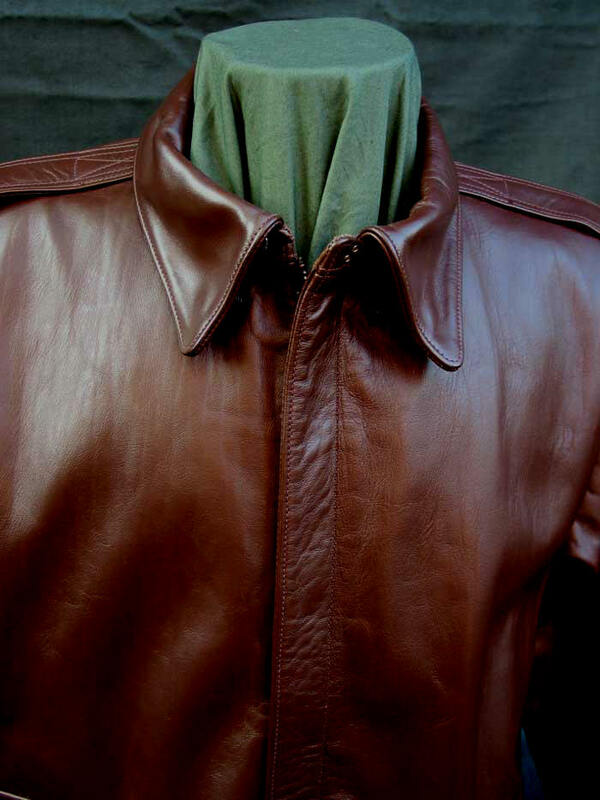 We conceive our jacket to emulate that A-2 which Jacob Dubow had cut, then sewn by his best cutter and operator to serve as a perfect production sample for the rest of his many workers, rather than a Xerox of a flawed piece such as one stumbles on at a military show or the like. Note Separate Horsehide Section Between Collar and Body: This is the "Collar Stand"